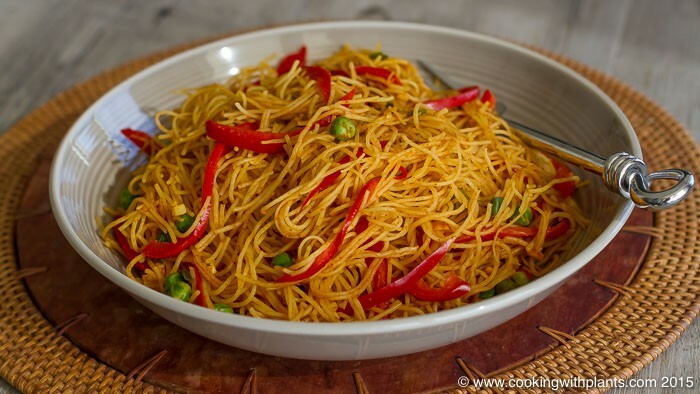 Today I show you how to make quick and tasty curried Singapore rice noodles using no oil and only healthy and delicious ingredients. This is a perfect dish to make when you are short on time but feel like a hot meal. It is also ideal to make ahead of time and pack into your lunchbox for work or school. Heat a non-stick fry pan to medium-high heat. Add peppers and stir until softened. Add scallions and stir through again. Add garlic and stir through for a minute or so. Then add the frozen peas and stir through for a minute more. Add tomato paste and spices and continue to stir for another minute. Add chili in at the end if you like your food spicy! How would the ingredients be if I was serving 6 ? This recipes serves 2. So triple the recipe for 6 serves. This is so yummy, just had it for lunch. Love your recipes. I watched this on you tube and saw your links to articles about ‘oils”. If that isn’t enough to stop one from cooking with it, I don’t know what would. Thanks for the info. Fantastic Pauline… so glad you took this important information on board! This looks amazing! All of the color is like a rainbow of health. Thanks for the recipe! Maybe try chilli instead… or middle eastern spices. Ii added broccoli and a vindaloo curry spice- and tossed with a light peanut- lime sauce- sooooo good!